Jonathan Franzen speaks to students in the Living Writers course. 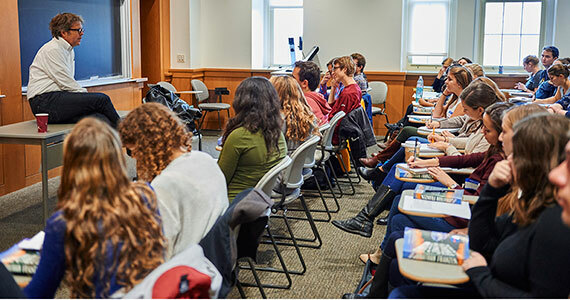 Our class starts the same way it does on any other Thursday, except this week English professors Jennifer Brice and Jane Pinchin walk in with renowned author Jonathan Franzen. They introduce him and say, “He knows the drill,” which we all know means we get to spend the next 75 minutes asking him any questions we want. In our Living Writers class, we all had read Freedom prior to his visit. In addition to our classroom discussions, great conversations have also been taking place with some of the nearly 800 students, alumni, parents and community members enrolled in Living Writers on ColgateX, an online version of the course. In class, Franzen was very forthcoming. He revealed details about his personal life, such as his troubled marriage that contributed to elements in Freedom. Those details served as a testament to a statement he made later: that a writer must put everything they have into what they are working on, and that good, realistic fiction can’t be achieved unless writers make themselves vulnerable in that way. I can’t describe Franzen’s visit accurately without acknowledging the flashes of humor he showed during his visit. He started off a public reading and Q&A following our class by draping his holiday-themed napkin over the podium, commenting on the colors. He read what he described as a self-contained first-person narrative that will be part of a novel he hopes will be out next summer. The narrative describes the character Tom’s perspective of a day spent with his former wife, one of their “binges” as Tom calls them. Then Franzen fielded questions from the audience and from those watching online. When asked about how he handles fame, he answered honestly in saying he doesn’t think he’s handled it very well. He added how weird fame is for him, saying he spends so much of his time alone writing that it is a very odd transition for him to interact with the public so much. Today, another well-known author, Marjane Satrapi, will be on campus to discuss her graphic novel Persepolis. All are invited to attend a public reading and Q&A in Love Auditorium at 4:30 p.m. If you are unable to attend, there will be a live webcast available as well.